[A] Which sense is affected during air travel? [Q] Which sense is affected during air travel? Flying can be a very liberating experience. It is incredible to think that it wasn't so long ago that air travel seemed impossible, but now people take flights every day. Planes can take you to places you never could have reached otherwise, and can help you have some of the greatest adventures of your life. Unfortunately, though, air travel isn't all sunshine and rainbows. Here are four weird effects that it can have on your body, and what to do about it. 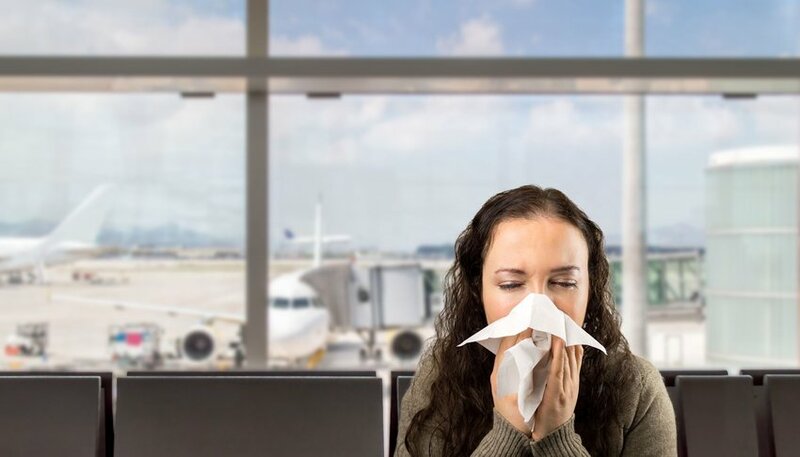 If you have noticed that you are more likely to get a cold or the flu after taking a flight, you are not alone. More than one in five people come down with an illness after flying, and you can thank the close quarters and the recirculated air for that. A lot of people (some of whom come from other countries and carry other strains of cold or flu viruses that your body might not have defenses for yet) sit very close together, which is just asking for cross-contamination. The recycled air may not help either, and neither does the dryness of that air, which makes you produce less mucus to keep germs from entering your nose and throat. One of the best ways to stay healthy is to wash your hands or use hand sanitizer often, wipe down your tray table before eating off of it, and remember not to touch your eyes, nose or mouth unless you know your hands are totally clean. In addition to the dryness of the air on a flight, and it is worth noting that it can do more than just dry up your mucus. The arid air on a plane can wreak havoc on your skin as well, draining all the moisture out of it and making you feel like a snake that needs to shed its dry, itchy skin. It could also have the opposite effect, though: some people find that their skin becomes more oily instead, as it struggles to compensate for the dryness of the air by kicking its own natural oil production into overdrive. The best way to avoid both of these problems is to moisturize your skin before, during, and after a flight, and to drink a lot of water.